This year’s roaring twenties theme was a hit, judging from the attire on display! What a swell party it was! On March 10, 2018, 140 of our favorite people dressed up in their gladdest rags, got a wiggle on and ankled over to Meany Center for Center Stage, our annual gala. Feast your peepers on these pictures if you don’t believe us! Brooklyn Rider previews what they'll be playing on our International Chamber Series next season! And speaking of feasting, Tom Douglas put a modern spin on some pretty traditional ‘20s fare from Pigs in a Blanket (featuring Bavarian meats in a cracked black peppery pastry) and champagne Jello shots (did you know Jello was a sign of privilege back in the day?—you had to have a refrigerator to make it!) to Waldorf salad and a lavender pavlova for dessert. 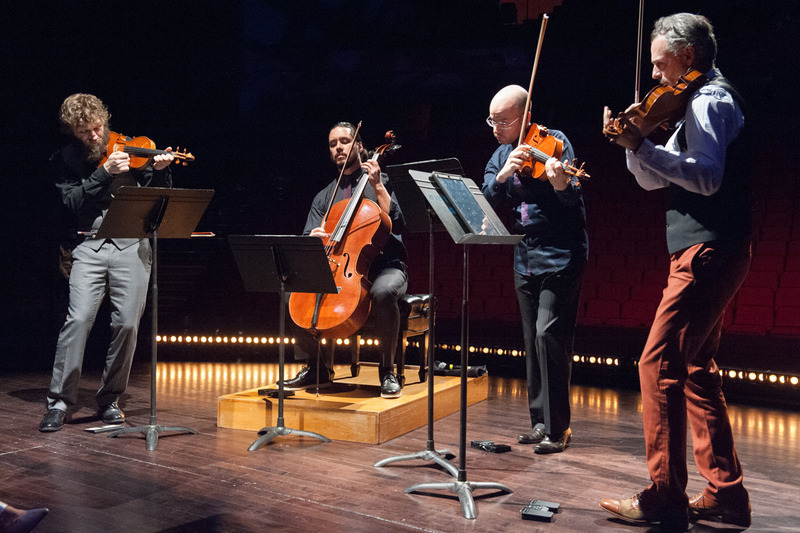 A highlight of the evening, the Season Preview, was extra special this year since Brooklyn Rider, one of the string quartets appearing on the International Chamber Series next year, also provided live entertainment for the night. We believe in truth in advertising! And while the party was, indeed, S’wonderful, it was the generosity of our guests that made it truly S’marvelous—together, we raised approximately $370,000 in support of Meany Center artistic and educational programming! In 1920’s lingo, that’s a LOT of cabbage! So thanks Big Spenders--for spending a little time with us! Show your Husky ID to receive $10 student tickets. Available in advance at the ArtsUW Ticket Office or on the night of the show at the Box Office at Meany Hall.